Head Related Transfer Functions (HRTFs) are essential to research in the field of binaural sound reproduction. HRTFs can be obtained from existing databases, but there are also a few rare facilities around the world where you can get your very own HRTFs measured. This is what a group of scientists from AudioLabs and Fraunhofer IIS ventured out to do last week. HRTFs characterize how the two ears of a human perceive sound waves approaching from different spatial directions. Humans can localize sound in three dimensions based on interaural time-delays (ITDs), interaural level differences (ILDs) and spectral colorations. These are the result of the size and shape of the head, ears, shoulders and torso. Resonances (e.g. cavum conchae) can boost certain frequencies, while reflection and diffraction effects attenuate others (acoustic shadow). 14 scientists from AudioLabs and Fraunhofer IIS went to visit RWTH Aachen University to each get their own HRTF measured. The Institute of Technical Acoustics (ITA) at RWTH Aachen has one of the most advanced, precise and fastest HRTF measuring systems in the world. The measurement setup was designed to achieve the highest resolution and individual HRTF measurement in the shortest period of time. The setup comprises 64 loudspeakers placed on an arc with a radius of approximately 1.5 m. The person to be measured stands on a turntable with the center point of his head as the center point of the arc and is rotated in 5° steps. Miniature microphones were placed in the ears to record the sound at the entrance of the ear canal. During the measurement, sweep excitation signals are played on the speakers of the arc. The participants had to stand still and “listen” to these sounds for about 12 minutes. The system is so fast because all speakers play at the same time, but with a different frequency. 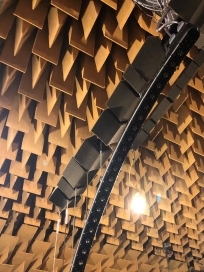 The measurements were carried out in a semi-anechoic chamber. The data gives our scientists the possibility of a more realistic binaural reproduction, as well as a broad basis for further research. The comparison of generic HRTFs with simulated HRTFs is of particular interest. To make the trip from Erlangen to Aachen even more rewarding, the group could experience the aixCAVE at RWTH. Constructed and installed in August 2012, the aixCAVE is a large five-sided immersive Virtual Reality environment. The AudioLabs’ Professor for Virtual Reality, Frank Wefers, was responsible for the audio system of the project. With a ground plane of 5x5m (glass floor with rear projection), the system is one of the largest worldwide featuring an outstanding level of visual quality. The acoustic system installed in 2015 supports – together with the visual projection – a multimodal presentation of the virtual environment. For that purpose 12 loudspeakers and 9 subwoofers have been installed at the ceiling. In addition, passive room acoustic optimization with large absorbers reduces the reverberation time inside the aixCAVE and mitigates break-in noise, i.e. from the cooling fans of the projectors outside. A total of 22 microphones pick up the acoustic signals inside the user space and allow for communication and interaction with the reproduction system. All in all the system achieves a very high level of immersion and illusion of presence – everyone was thrilled by this very impressive experience.